One of the most anticipated brewery openings in recent times became official Saturday evening. Little Beast Brewing, the creative child of Charles Porter and his wife and partner, Brenda Crow, held a launch party at OP Wurst in Southeast Portland. A fine time was had by all. I'll get to the Little Beast details shortly. This was a significant event because Porter has a rich brewing background. He co-founded Logsdon Farmhouse Ales with David Logsdon in 2009, then abruptly departed a couple of years back. It took some time to get Little Beast off the ground. Porter lives in my neighborhood and I got vague updates on the project from time to time. Breweries open every day. You know this. 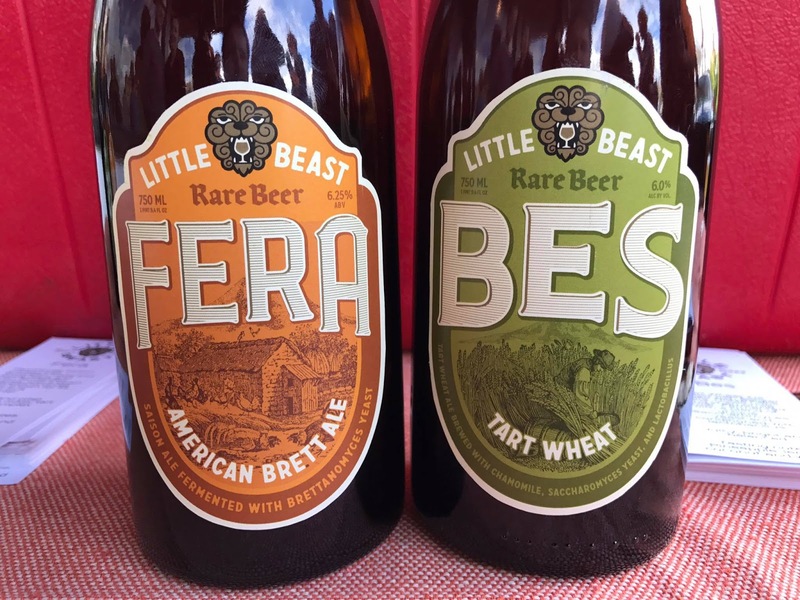 Little Beast is special because Porter doesn't make typical beers and his beers have won awards in significant competitions. His particular talent is producing mixed culture brews that lean on local produce and micro-flora. Barrel-aging and bottle conditioning are part of that, obviously. In fact, the Little Beast name itself is nicely conceptualized. How so? Because it's the "little beasts" in micro-flora that ferment the farmhouse and wild ales Porter is known for. A degree in biology provides him with an understanding of yeast and bacteria, handy stuff to know if you're going to monkey around with wild and sour beers. There's a significant and growing interest in these beers. Cascade Brewing has built an empire on its sour beers. DeGarde in Tillamonk has done well with its wild ales, as has Wolves and People out in Newberg. There's also Yachats Brewing, where Charlie Van Meter, who worked with Porter at Logsdon, is producing some uniquely unconventional beers. Little Beast will for now operate out of the former Brannon's Pub & Brewery in Beaverton. They're occupying the brewing space there while Westgate Bourbon Bar and Taphouse operates the pub portion of the space. This is a relatively inexpensive way to get the brewery up and running and to build a following. A taproom somewhere in Portland is in the future. Samples of Bes, a tart wheat ale, and Fera, a brett-fermented Saison, were poured at OP Wurst. Porter also shared a few bottled beers around. Everything was pretty tasty. I preferred the Bes to the Fera, but that was a tough call. Many liked the Fera. Little Beast will offer year-around flagship and seasonal beers in draft and bottled form. Limited, exclusive stuff will evidently be sold direct via some sort of membership. I'm guessing the standards will show up intermittently in area beer bars and bottleshops. There's a tentative list of shops and bars coming and I'll update this post when/if I receive it. I expect Little Beast to do well. They have a premium product that's somewhat unconventional and Porter is no stranger to brand building. But these are strange times in craft beer. It's getting crowded out there. Nothing comes easy. Porter and Crow know this. I'm on the Fera side but yes, both were tasty. You probably already saw it but there is a Little Beast event at BeerMongers on Friday. Yeah, the Fera. Lots of people seemed to like it. I saw the Mongers event. They've also got one at Loyal Legion tomorrow. It looks to me like they're spreading the news widely, which is a good thing. I wish them the best.